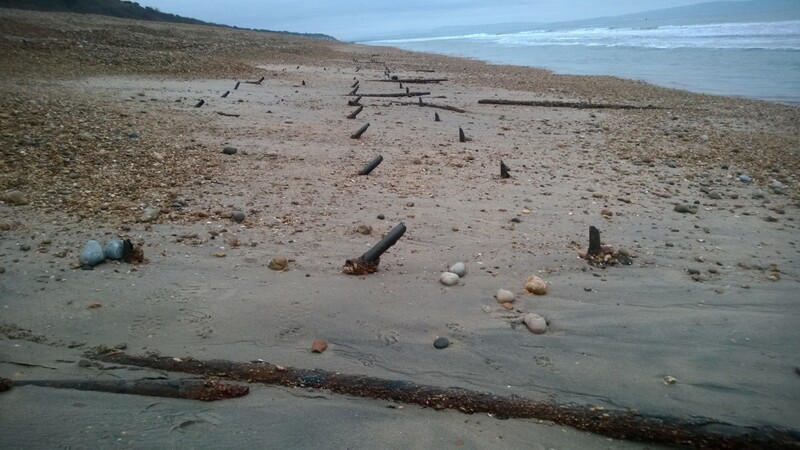 In March of this year the last of the Second World War beach defences were finally removed from Hordle beach. These defences were known as Admiralty Beach Scaffolding or officially as Obstacle Z1. 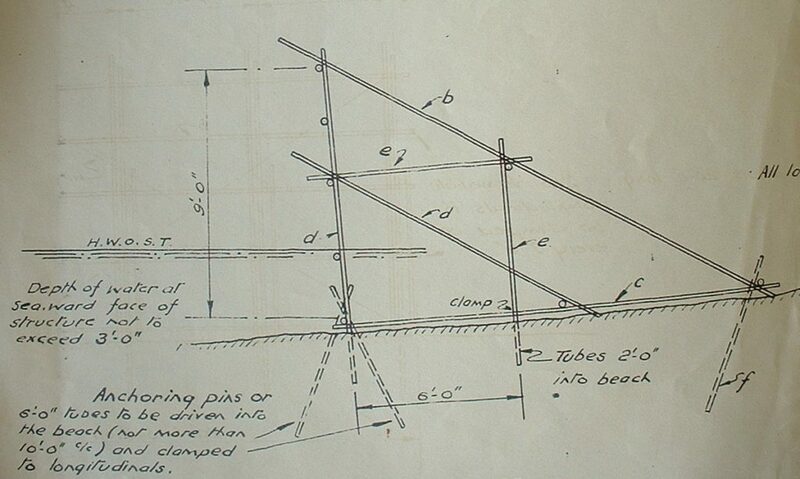 They consisted of tubular scaffolding poles anchored firmly to the beach and forming a metal fence or barrier which it was hoped would prevent landing craft and tanks getting onto the beach. The fence would have been about 9 feet tall above the high tide mark. Sections of the fence would have been constructed on the land and carried into the water at low tide. Admiralty trials of this defence found that a barge or a trawler could easily pass through the barrier but a tank would have great difficulty in getting up enough speed and momentum on the beach to break through. If you think this sounds a bit ‘Heath Robinson’ you are right. It was! It should be remembered that when these were designed and put in place in mid 1940 through to the spring of 1941 these were desperate times. There was a real belief that a German invasion was imminent during the summer of 1940. Once the Luftwaffe had been defeated in the Battle of Britain and autumn gave way to winter it was thought that the invasion was merely postponed until favourable spring conditions offered the Germans an opportunity to launch Operation Sea Lion and land on our beaches. 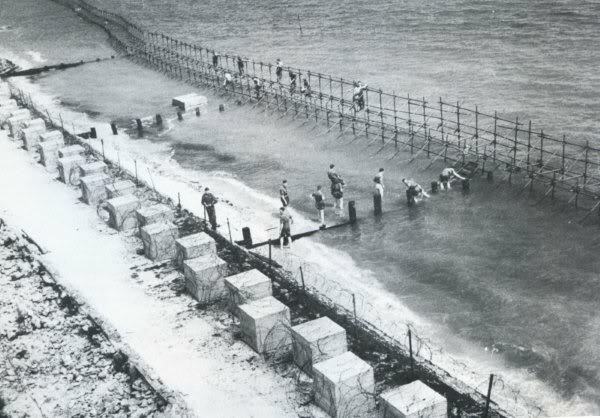 The Admiralty Beach Scaffolding was put in place along the British coast line on beaches where a landing was thought likely. These defences stretched from the east of England round to the south western peninsular. The beach scaffolding was not the sole means of defence. There were other impediments as seen in this image which shows concrete blocks, known as tank traps, designed to stop tanks coming ashore. Some of these blocks were visible for many years at Hordle in the Taddiford gap area before coastal erosion claimed them. Studies of the local defences also reveal a minefield at Chewton Glen and another in the area of Barton Golf Course and Becton Bunny. The war diaries of military units stationed in our area make interesting reading. They are available at the National Archive in Kew. Studies of these documents reveal that the 11th Battalion the Royal Fusiliers were responsible for the erection of the scaffolding during the winter of 1941. 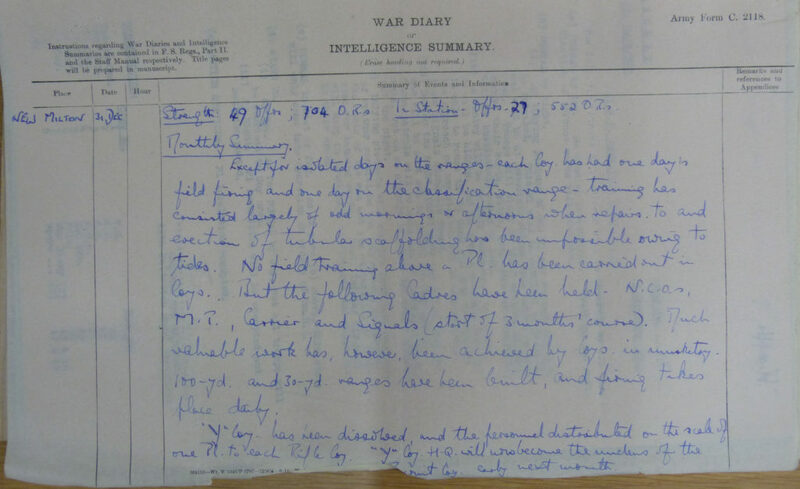 The December 1941 war diary summary reads: Except for isolated days on the ranges each company has had one days field firing and one day on the classification range. Training has consisted of odd mornings or afternoons when repairs to and erection of tubular scaffolding has proved impossible owing to the tides. That must have been an unpleasant task in wintertime. What the records tell us is that a single battalion of roughly 800 men defended the coast line from Highcliffe through to Keyhaven. One company were based in Highcliffe, one at Barton and another in the Milford and Keyhaven area. A fourth company would have been inland in reserve, based at Fernhill Manor and the battalion headquarters was at Great Ballard House, now Ballard School. The diaries of other battalions reveal that in the period of the Battle of Britain, Great Ballard and our coastal area was visited on separate occasions by the then Major General Bernard Montgomery, General Alexander and General Alan Brooke. They were inspecting the front line defences and ensuring that the forces were as well prepared as the circumstances allowed. The 2nd Battalion Lancashire Fusiliers who were stationed in New Milton during the bombing of our town on 23rd of August 1940 state in their war diary that they were stood too in anticipation of an invasion likely to happen from the period 7th to the 19th of September. Other diary entries reveal bombs being dropped in our area, heavy enemy aircraft activity and a civilian in a sailing boat at Keyhaven being machined gunned by enemy aircraft. After the war was over, the defences were removed in a slow methodical manner. The immediate requirement was to lift all of the minefields. 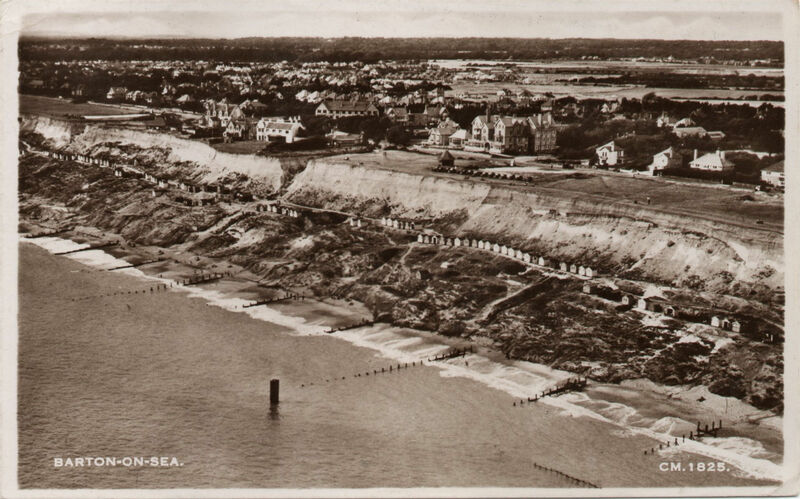 There is a record that in 1945 soldiers playing golf at Barton on Sea became casualties when one stepped into the rough to retrieve a ball and stood on a mine. Evidence of the Admiralty scaffolding can be seen in the bottom right corner of this postcard dated 1949. You can just see in the waves breaking on the shore the fence. The way that this type of defence was disposed of locally was to simply cut it off at the base. This left a sharp jagged remnant which was covered over by shingle. Over the last 18 months tides and storms have washed away the shingle to reveal at low tide the stubs of the scaffolding tubes.
. New Forest District Council used the CITiZAN archaeology project to carry out a survey of the beaches. They located the remains of the defence work. At the end of March 2017 NFDC arranged for contractors to remove the remains. A large pile of rusting tubing and clamps were removed. Also uncovered were two spigot mortar bombs. These were made safe by a military bomb disposal unit. Spigot mortars were mainly used by Home Guard units and were yet another defensive weapon thought up and rushed into service in the days when enemy invasion was believed to be imminent. 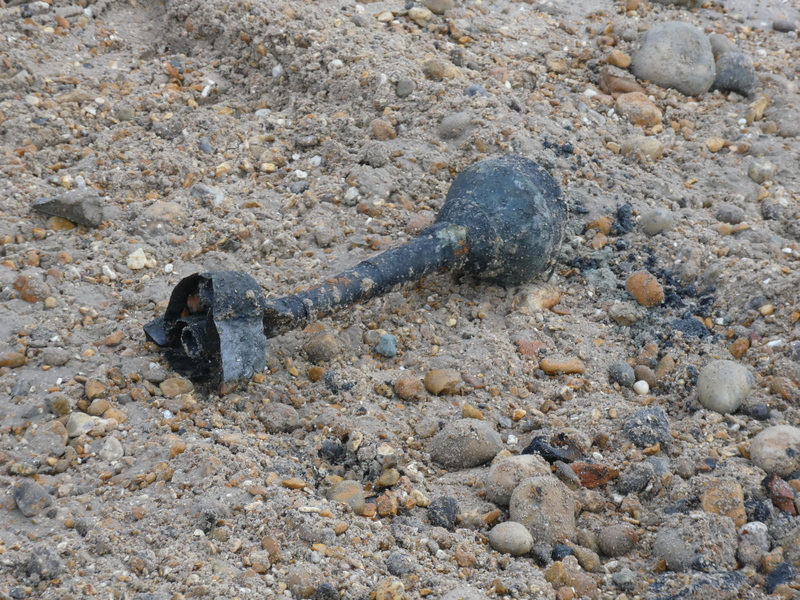 In this case the device appears to have been located on Hordle cliff tops and fired on to the beach, most likely as a practice or test of the weapon. If any readers have any information, photographs or memories of the war time beach defences or Home Guard unit in our area, please can they contact the author who would like to record publish the information in a forthcoming exhibition.